Flicks With Friends continues to dominate most of my creative output time at the moment. Check it out if you haven't yet, and consider becoming a Patreon. As returning Best in Show champs, we are gearing up for this year's 4 Points Film Fest in November. Last year's 4 Points film Course Correction was just named a selection of the St. Louis International Film Festival. Been spending a LOT of time with Flicks With Friends (www.flickswfriends.com) and that site is coming along nicely. Conveyance inches closer to reshoots, as I have some new ideas on the project and if I have to redo it, might as well make improvements where I can. We can add another Laurel to Course Correction, the film was accepted as an entry in the Saint Louis Science Fiction & Fantasy Short Film Festival. It just won Best Ensemble, Best Musical Score, Best Directing, as well as being named BEST IN SHOW! 40 films entered this competition, only 15 were selected to compete. This also makes our film an "offiical selection" for the Saint Louis Internaional Film Festival in November. More restructuring. Flicks With Friends has expanded to its own website, www.flickswfriends.com. We will link to it from here, but please go there for all episodes and reviews. We just completed a fairly substantial reworking of the website, specifically the Flicks With Friends and Movie Review tabs. Hopefully the changes mean a better work and search flow for you to be able to find what you're looking for instead of scrolling through one huge list. We may implement this change on the Shorts page as well if it works, so please let us know! Several new reviews posted, and almost more importantly, a new episode has (finally) been uploaded. Check out our look at Back to the Future! Reviews continue to be posted under the FWF Movie Reviews tab. Course Correction has been entered into several other film festivals. 1) MANY new reviews listed on the FWF Movie Reviews page if you are interested, check them out! 2) In regards to Course Correction, we did NOT win the Audience Choice Award. But we did win Best in Show. This means the film will be shown as the winner of the Four Points Film Competition at Filmapalooza in Paris, France, AND will be featured with other short films at the Cannes Film Festival. I am incredibly proud of this one, and my heartfelt thanks to everyone associated with it, with 12:22 Productions, with Berkeley Square. From the friends who drop everything to be extras, to the ones that are part of the core writing staff, we could not do this without you, and I am so grateful to not only have you in my life as a friend, but to have your support in my wild flights of fancy. 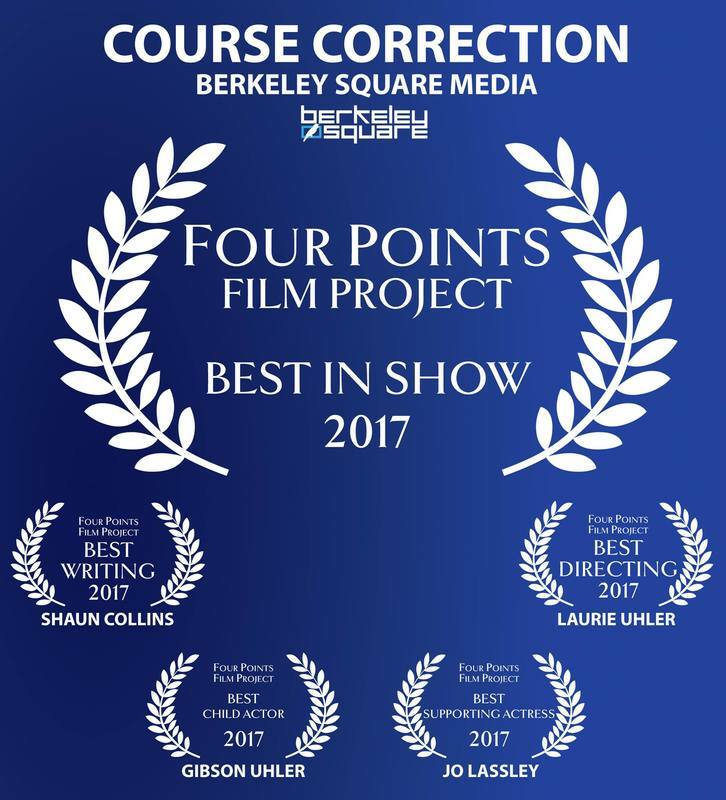 Course Correction - Four Points Film Project - Berkeley Square from Berkeley Square on Vimeo. ​Friends, I could use your help! We took part in the Four Points Film Project a few weeks back and our film "Course Correction" has been chosen from 129 short films submitted worldwide to be one of 16 finalists for an online Audience Choice Award. These are films that were made inside of 77 hours from a set of provided criteria. Wanna help us WIN that Audience Choice Award? 1) VOTE for us: https://www.surveymonkey.com/r/fourpointsfilmproject It takes less than 15 seconds, no registration required. Once you click, choose "Berkeley Square - Course Correction" and click SUBMIT. That's it! The link to watch all 16 films is https://vimeo.com/channels/4pfp2017 If you do not want to spend TWO HOURS watching the other films, then just vote for "Berkeley Square - Course Correction"
​2) Then, spread the word and ask all your friends to vote for our film! Voting ends December 10th at 8pm Pacific Time. 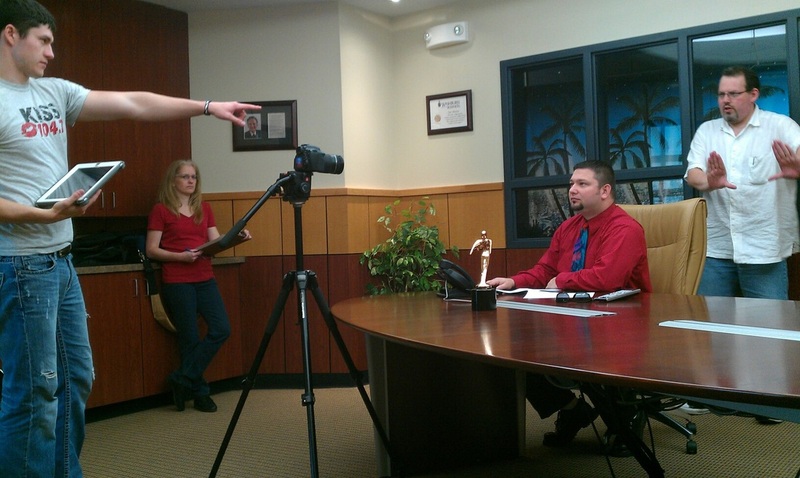 "Course Correction" is in the can, and submitted to the Four Points Film Contest. Wish us luck! Been a little stymied with the longer discussion panels and topics for flicks with friends, but they are coming. SLOWLY, but coming. Reviews however, are moving at a good clip and there are MANY more posted. Flicks With Friends continues to roll, new episodes and reviews are on those pages, respectively. Results are in, and we were not. :( While the short film What Darcy Saw made the top eight choices for the screening at the 48 Hour Film Project Kansas City, we did not place . We DID win Best Editing, and Best Use of Prop (Hat). Many, many, many people told us they thought our film was the best one shown, so it came as a bit of a shock to them (and us) to not place. Ah well. Still proud of the film and all the folks who saw it. We have uploaded the actual film now that the embargo has ended, you can find it over on the shorts page. What Darcy Saw - 48 Hour Film Project - Trailer from Berkeley Square on Vimeo. If you are so inclined, September 5th at 6:30pm at the North Screenland Armour in Kansas City is the top ten films screening and awards. My understanding is that tickets are available through the 48hr Film Project website. We'd appreciate your support. Alas, several projects were lost when an external hard drive failed. (I will NEVER buy another seagate product as long as I live) This includes several upcoming episodes of Flicks With Friends, and Coveyance, which had moved into post production and will now need to be reshot. Le Sigh. It seems weird to label this a December update when it is being written on 12/29, but I wanted to let you all know the movie video blog ​Flicks With Friends has offiically launched. Please subscribe to our Vimeo page! Updates to the Cross Pollination page. Announcing a new short film coming soon... "Conveyance". See the above trailer, and stand by for more details on this one! And a MAJOR announcement concerning the new video podcast "Flicks With Friends" ...scripts are being written, concepts bounced around, guest stars lined up and we are heading into production this month with an eye on a Christmas 2016 release! The Videos page is now listed as Shorts, to differentiate it a bit more from the stuff over on Projects. Plus it allows me to make juvenile jokes like, "Wanna check out my shorts? You know you do." Oh yeah. I've also added a few commercials to the Projects page. Wanna check out my projects? ...just doesn't have the same ring, does it? Oh well. Also, there is a new page added called Flicks With Friends. Just a promotional coming soon spot at the moment, but I'm hoping to launch this baby in the near future. Stay tuned!!! It occurs to me that while I update the individual pages on the website, I haven't really touched the front page and some of you may not realize there are, in fact, updates going on. So consider yourselves updated! There are new films under videos (including our new First Place and People's Choice winning entry into the summer Wild West Film Fest) and new projects in the Portfolio page. And of course, the Ka-Tet of Geek has all my latest blog bits. Just for you. Enjoy. Tuesday, May 8th 2012 marks the culmination of a dream. Or a nightmare depending on your point of view... We are now live on the web.